Saying that high school and college students lead busy lives is an understatement. Between shuffling from class to class, studying late hours, and extracurricular school activities, students are lucky if they even get to have 8 hours of sleep or have a social life! This is why the right backpack is an essential school accessory. But with the dozens of school backpack styles out there, how do you choose what’s right for your needs? Price, for many, is the first and most important factor to consider. Spend money on a poorly made backpack that costs less, and more often than not, you’ll end up having to replace it many more times throughout your student years. Many students (and parents) are also on a budget, so pricey designer backpacks aren’t always an option. Finding that sweet spot between a friendly price and good quality can be challenging. You’d also need to consider the capacity and size of the pack. Can it fit your daily needs, including heavy textbooks, without weighing you down? Does it have room for your laptop and electronics? Students of different levels have specific needs in the capacity and size department, so it’s necessary to consider this too. Comfort is a priority as well: considering that you’ll be carrying a backpack with you throughout the week, it should be comfortable enough to wear without digging through the shoulders or back. Backpacks should support you and not be a health hazard. The High Sierra Swerve Laptop Backpack is the ultimate high school and college backpack. It meets all these requirements but has many more convenient and thoughtful features. One of its main advantages is its size. The bag isn’t small, but it isn’t too big either. At 19 x 13 x 7.8 inches, it’s just the right size for daily use by students who need to bring a lot of gear plus a laptop. Speaking of laptop, this backpack is built with an innovative CushionZone laptop compartment which can accommodate most laptops up to 17 inches in size. It also has a TechSpot sleeve built specifically for protecting your tablet. High Sierra is a brand known for producing high quality, durable bags for the outdoors. They’ve recently expanded to laptop backpacks, and it’s clear from their line of bags that this is another thing they’re doing really well! They’ve been making practical, versatile gear for adventurers since 1978, so you can be assured that High Sierra bags are made to last. 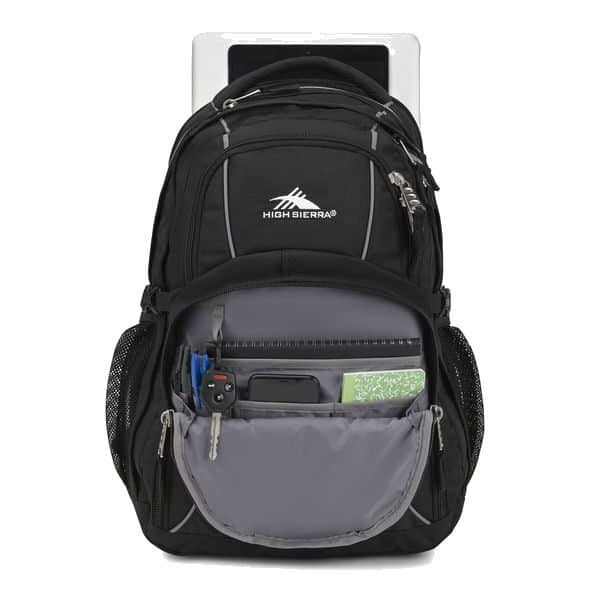 The High Sierra Swerve Laptop Backpack has all the right features and more for both high school and college students. It doesn’t hurt that the bag looks great, too! The main compartment itself is extremely spacious, allowing you to keep your binders, books, and notebooks neatly. Several other pockets help you stay organized – because the last thing you need in school is to spend time you don’t really have looking for your things. A zippered mesh pocket, lidded media pocket, key fob hook, and pen pockets are all found within the bag. Its unique multi-compartment design lets you pack things both big and small in a way that saves you time. Aside from all its great storage and organization features, another aspect that students will love is its Suspension System, which provides much-needed relief from carrying heavy loads. The Suspension System works by absorbing the shock of the bag’s weight through efficient weight distribution, and together with its ergonomic, contoured and padded air mesh shoulder straps, this backpack feels light even when its contents aren’t. The High Sierra Swerve Laptop Backpack is also versatile; a padded grab handle allows you to transport your bag in two different ways. The padded bottom panel is another convenient feature that ensures your back stays upright even if it’s empty. All that – at such an affordable price! The High Sierra Swerve Laptop Backpack clearly did not cut corners when it comes to craftsmanship, quality, and aesthetics. You’ll look cool on campus but feel good, too, thanks to its superior features that make carrying your heavy belongings so much lighter. 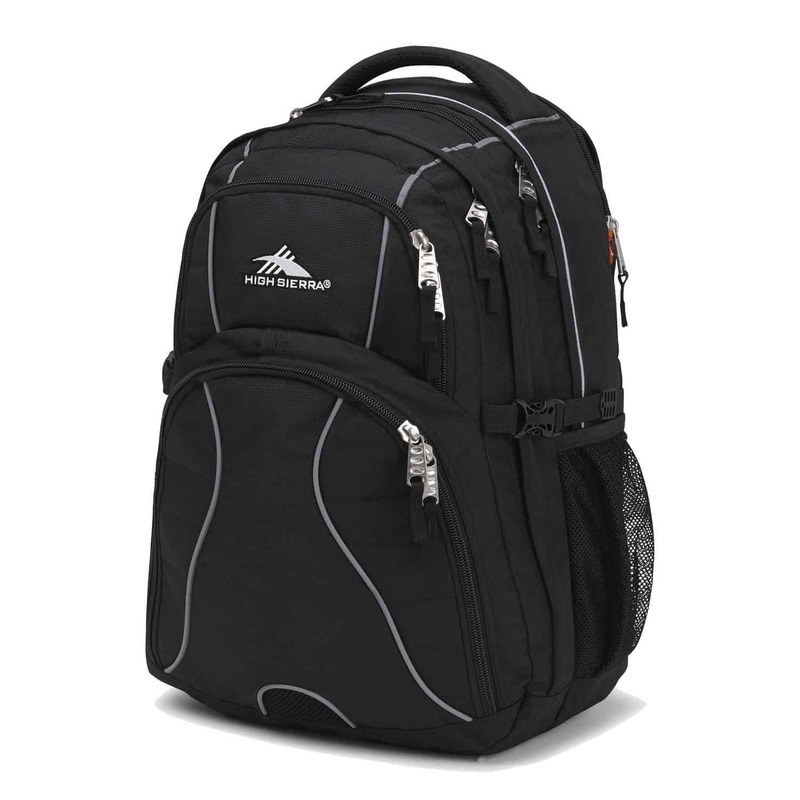 The High Sierra Swerve Laptop Backpack is a terrific choice of bag not just for students. Customer reviews sing praises about this bag, and they come from all walks of life. It’s clear from the online reviews that customers appreciate every single feature of the High Sierra Swerve Laptop Backpack. Its superior storage space can accommodate several heavy textbooks, and it doesn’t crumble under pressure: it will seriously last you years of heavy, daily use. The padded laptop compartment will protect your computer no matter what happens. In fact, the adjectives “best” and “perfect” are used liberally by so many happy customers! On the other hand, some customers were displeased with the quality of the zippers. Even gentle use lead to it breaking in just a few months. Should this happen to you, the good news is that zippers are fairly cheap and simple to replace at your local tailor. Upgrade your student life with the High Sierra Swerve Laptop Backpack, which you can get at a great price online. 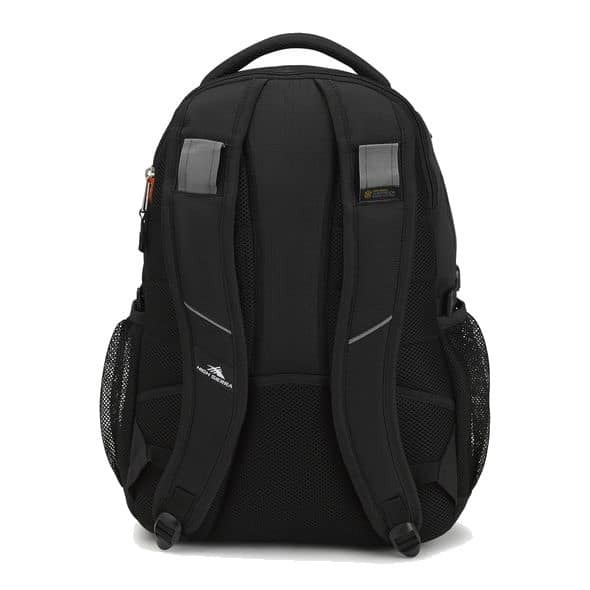 Lazada Singapore is among the leading sites for promotional deals on many items including this backpack – we recommend checking it out before you make your final decision. Lighten your load with the High Sierra Swerve Laptop Backpack - you’ll never look back. For high school and college students whose priorities are storage and durability, you just can’t go wrong with this model. It’s an affordable backpack choice that will support your school needs for many years to come.